At the age of 30, Aine Ni Cheallaigh began to develop mysterious symptoms. Her health was eroding and she felt that she was aging faster than everyone around her. Suspecting that toxins were to blame, she had her mercury fillings removed. But restoring her health wasn’t going to be that simple. Over the following months, she found herself catapulted into a nightmare of mental and physical illness. Getting the Mercury Out follows this ordinary woman’s quest to solve her health mystery. Can she cure a disease that the medical establishment won’t even admit is real? Can she find a treatment that will restore her to health and sanity? Sometimes funny, often heart-wrenching, this book is a deeply engaging story of personal struggle and endurance. 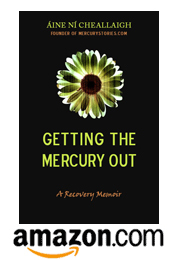 It’s an eye-opener for those who are curious about mercury poisoning, and an absolute must-read for anyone grappling with the desperate search for healing. You don’t need a Kindle device to be able to read this eBook. It can be read on a PC, Mac, iPad, iPhone, Android, or Blackberry too! Right now, only the eBook is available–the paperback edition will follow in a couple of weeks. Thanks for your support, everyone! I hope the book lives up to expectations. Let me know what you think of it by commenting here or sending me an email. And if you really love it, please post a review on Amazon, so everyone can hear how great it is! ← When is the Book Coming Out? Congrats Aine. I look forward to a good read. Definitely interested to read this, going to hold out for the paperback though. I’m really struggling with AC chelation and it will be great to have something to keep me optimistic.. I know what you mean. Chelation can sometimes feel like it’s eternal. When progress was slow (or things were going backwards) I wished I could pick up a book that would remind me that this damn thing really WORKED. I bought your eBook and read it on my iPhone on my way to work. Until now I have read half of it and I just can say thank you for writing it. It is like a mirror to me and I guess to many others who suffer from mercury poisioning as well. There are often passages in your book that make me think ‘uh I had this too’ or ‘yea your absolutely right’. The part where you write that mercury feels like a daemon taking over your body says everything. I hope nevertheless you will keep on posting here on your blog. I really appreciate reading stories from you. It means a lot to me to hear that you identify with my experience. Mercury toxicity is so weird, when I was writing the book, I wondered, Is anyone really going to get this? Is this book going to make sense to anyone? So I’m very glad to hear that you understand what I went through. And yes, I will definitely keep posting here on my blog. You would think that after writing a full book about my recovery that I would have said it all, but I keep thinking of different things that I didn’t get around to writing about. Believe me, I have a lot more to say about mercury poisoning! I wonder if you have had a similar experience to me: when I finally, after 9 years, came to realise that heavy metal toxicity was the point of origin underlying my very odd pattern of symptoms, I took a great deal of time to do lots of personal research on the subject. Whilst it remains a huge and highly contentious subject, I do now understand /some/ of the complexities of heavy metal poisoning. Occasionally, now, when I see, and think about, the symptoms and behaviour of certain people in my life, I find myself wondering if they, too, might have a similar point of origin underlying their situation. When one speaks to people who lack the tenacity or willpower to dig deeper (much deeper!) in seeking answers to symptoms their GP has never provided a satisfactory answer for, it is surprising how many people live their lives with a spectrum of symptoms for which they have no answer and no likelihood of ever establishing any, since they’ve been socialised to unquestioningly believe that if their medically-qualified GP doesn’t know the answer, then an answer will never be available to them, full-stop. Although I acknowledge that it may be nothing more than entirely-unrelated coincidence, it is intriguing that a surprising proportion of these people DO have amalgam fillings and/or a history of many vaccinations (world travel), or longterm use of contact lenses (thimerosal used to be a preservative in contact lens solutions). In short, I suspect that, like myself, there are a great many people on earth today who have varying degrees of heavy metal exposure which may be significantly contributing to various physical and/or psychological issues, these people remaining undiagnosed for reasons of ignorance (on both sides of the patient-doctor divide) and other, less-innocent reasons.